At HitchSource.com we strive to make it easy for you to find the right products for your application. We are providing this hitch selection guide to help clarify the hitch selection process. Once you have found the hitch for your vehicle using our hitch search tool below , check the bottom of the product listing for Other Suggested Products. Our hitch specialists have carefully selected related products that are a good match for each hitch. Hitch Finder. Use the HitchSource.com vehicle database to find the right trailer hitch for your vehicle. Does your trailer already have safety chains? If not, are new chains required? 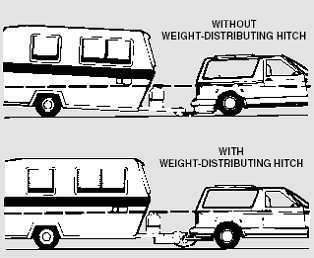 Two of the most important factors in selecting a trailer hitch are Gross Trailer Weight (GTW) and Tongue Weight (TW). First, you should determine the GTW and TW of your trailer when fully loaded. Table 1 shows some common examples of trailer weights. Then, you should determine whether your vehicle is rated to accept the weight of your trailer. Gross Trailer Weight (GTW) is the fully loaded weight of your trailer in the condition that you would tow it in. If you don't know the weight of your trailer, the best way to measure it is on a vehicle scale. Weigh stations in your area are a good resource for determining GTW. The Tongue Weight (TW) is the downward force exerted by the trailer coupler onto the hitch ball and the trailer hitch. Your vehicle's suspension carries this weight. In most cases, the TW is 10-15 percent of the overall trailer weight. 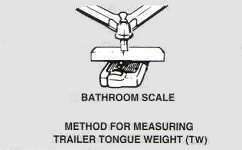 Tongue Weight of up to 300 pounds can be measured on a standard bathroom scale by resting the trailer coupler on the scale. You should make sure the scale is securely propped up so that the Tongue Weight is measured with the trailer coupler at the standard towing height. For tongue weights over 300 pounds, place a household scale and a brick that's as thick as the scale three feet apart as shown the figure below. Set a length of pipe on each and rest a beam across the pipes. Re-zero the scale to correct for the weight of the beam and pipe. Securely block the trailer wheels. Rest the trailer jack on the beam as shown, one (1) foot from the brick and two (2) feet from the scale. To obtain the TW, multiply the scale reading by three (3). For greater tongue weights, place the scale and brick four (4) feet apart, rest the jack on the beam three (3) feet from the scale and multiply the scale reading by four (4). Find your vehicle's maximum towing capacity by consulting the owner's manual. Contact your local car dealer if you cannot find the information or have lost the manual. Compare the GTW and TW ratings from your vehicle to the actual GTW and TW measurements from your trailer. If the vehicle specifications are higher than the actual weights of the trailer, then it's time to select a trailer hitch. Otherwise, you will either need to get a vehicle with more towing capacity or lighten your trailer. Determine which trailer hitch type is right for your application by selecting the row and column that best match your vehicle and trailer. Weight Carrying trailer hitches are typically used for trailers up to 3,500 lbs GTW and 300 lbs TW. Some vehicles such as pickups and vans have stronger springs to support higher loads. Weight Carrying trailer hitches support the entire tongue weight on the rear of the car. Most passenger car and light truck applications use Weight Carrying trailer hitches. Fixed Drawbar - The ball is mounted to a permanent platform that is fixed to the hitch. Because of the inconvenience of the fixed drawbar, HitchSource.com does not carry many fixed drawbar hitches. Removable Drawbar - The ball is mounted on a removable platform. The removable platform is commonly called a drawbar or a removable ball mount. Instead of directly supporting the trailer tongue weight on the hitch, the Weight Distribution trailer hitches apply leverage between the towing vehicle and the trailer. This leverage helps to distribute the trailer weight to the front of the towing vehicle and to the rear of the trailer. By distributing the TW, a Weight Distribution trailer hitch allows trailers with greater weights to be towed. The Weight Distribution trailer hitch also results in a more level ride and gives better steering and brake control. A Weight Distribution system includes a receiver attached to the towing vehicle and a removable hitch head and spring bar assembly. 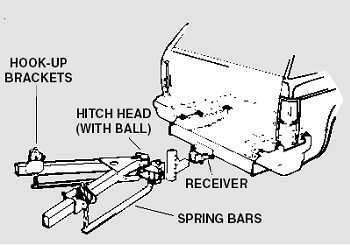 Most Weight Distribution trailer hitch heads and spring bar assemblies are designed to mount to the receiver of a standard Weight Carrying trailer hitch. * Some figures provided courtesy of Sequent Towing, Inc.